I was up late last night after taking a wonderful client up to the caves for Flamenco. So when the alarm went off this morning I was happy to see that the rest of my family was still asleep and I rolled over hoping for a nice lie in. It didn’t last long of course. Before I realized it I was up making breakfast with the company of my neighbor’s two year old and then quickly we were all off to school. Amazingly, a friend and I both found the energy to grab our bikes for a short ride and went to a beautiful town, Pinos de Genil, on the way to the mountains. 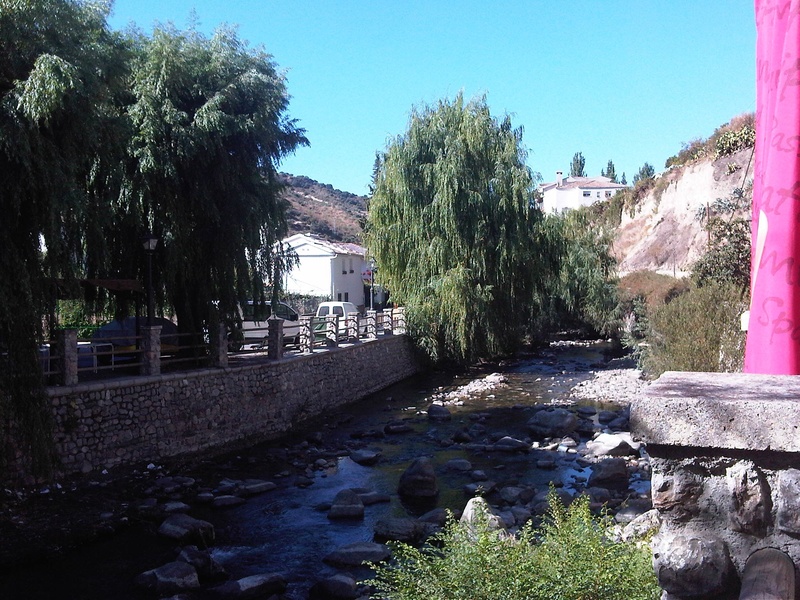 After drinking fresh cold water out of the town’s fountain we decided to have a quick beer at Bar Ricardo next to the river. 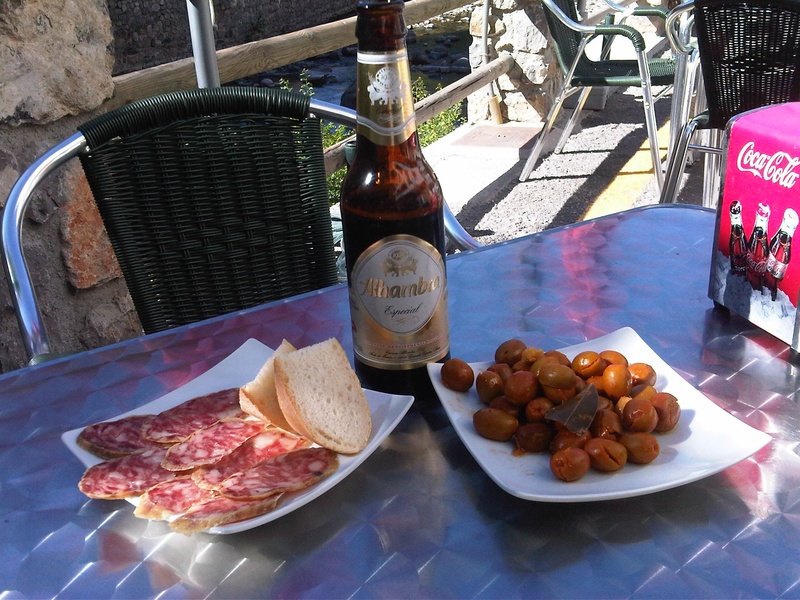 The moment improved when our server brought us a plate of delicious olives that had been seasoned with cumin and paprika and a bit of salchichón (salami). I had one of my “I heart Granada” moments listening to the sound of the river and recalling my Gypsy bliss from the night before. To prolong the feeling we decided to pick Luna up from school early and take her to another beautiful town up in the mountains for lunch and a hike. 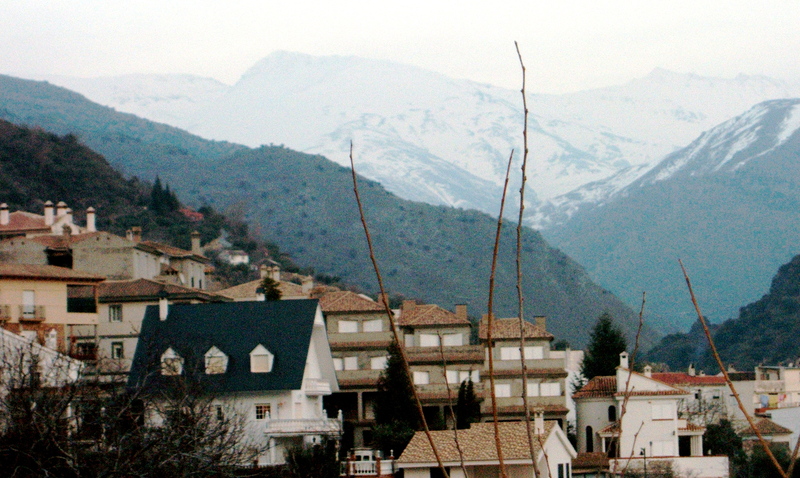 Guejar Sierra is a cozy mountain town about 10 miles from Granada. It has great restaurants both within the town and along the river that serve traditional food with an abundance of olive oil and local products. It has also been a favorite place of mine to go and enjoy the many hiking trails that take you along the river and into the mountains. There used to be a tram that went from the center of Granada to the start of one of the main trails, La Vereda de la Estrella. In the early 70’s the tram ceased to function due to lack of profit. The older people in the town are still quite disturbed about this, understandably so. We stopped in one of the restaurants along the river to eat something before our hike. We ordered the obligatory and delicious local potato dish, poor man’s potatoes. Patatas a lo pobre. 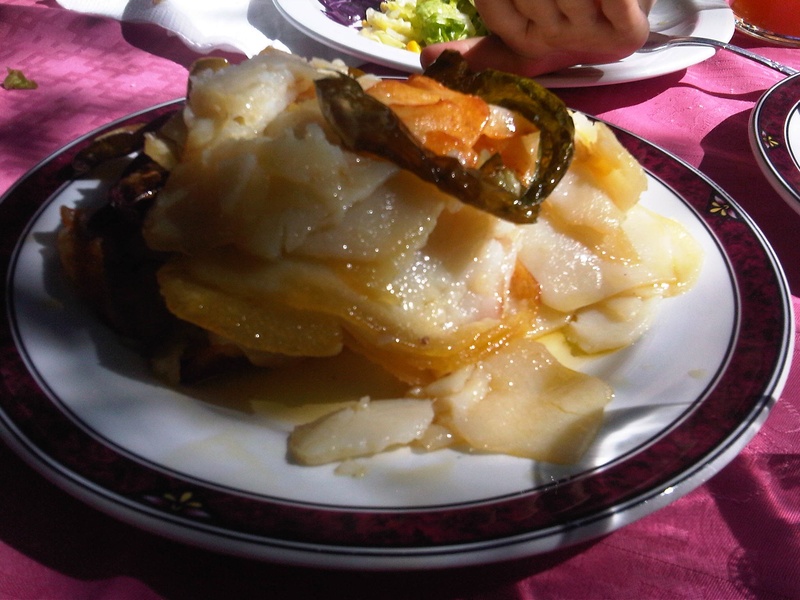 They are thinly sliced potatoes, green peppers and sometimes onions sauteed in an generous amount of olive oil. Simple and always gratifying. Luna had a hankering for chicken so we ordered a small dish of chicken in garlic (and plenty of oil) which was delicious with just a bit of white wine and about 10 cloves of crispy garlic. But the star dish today was the Padrón peppers. These peppers are named after a town in Galicia and were originally brought to Spain in the 16th century from Mexico. 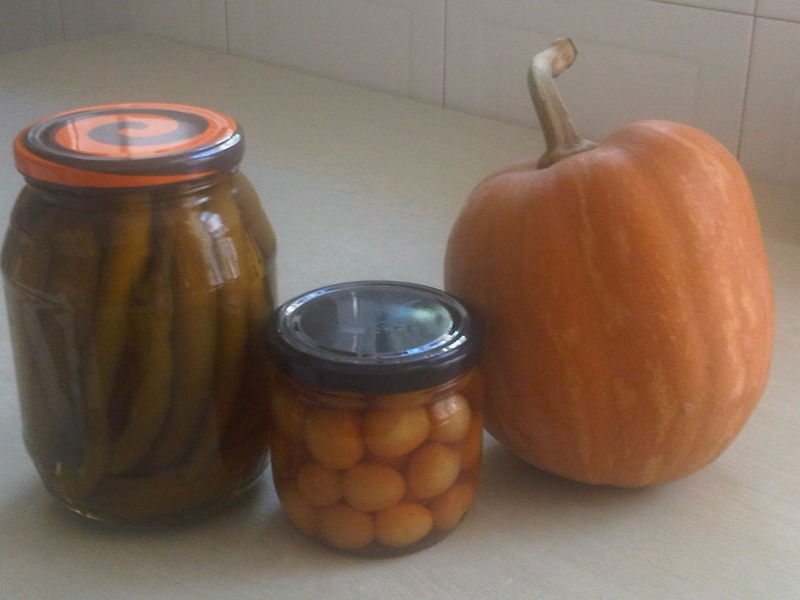 The ones we had today were grown locally. There is a saying about these peppers, “Pimientos de Padrón, algunos pican algunos no”. 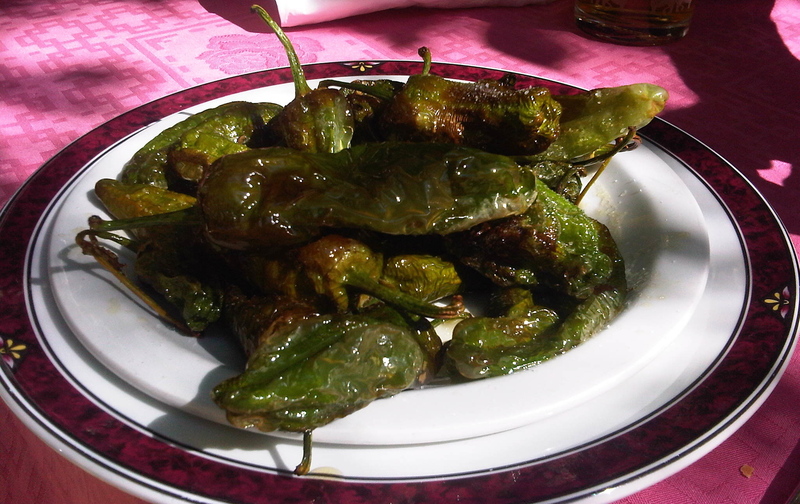 “Padrón peppers, some are hot, some are not”. They are served after being fried in olive oil and lightly salted. My friend took a bite out of the first pepper and handed it to me immediately. Usually these peppers leave me craving spice. If you are lucky, one in 15 is hot. Not today. They were all fire. And I mean FUEGO!!! I’m a spicy food addict and these were mind blowing. All of them. After our hike along the river we stopped in a local shop and bought some local treats. Onions, tomatoes, apples, pumpkin, cherries in strong alcohol, and pickled spicy peppers. The pickled peppers aren’t from Padrón but they are just about as picante! !